This is an update about the So-Called Dollar HK-722 Series HK-722, (HK-722A, and HK-722B). They are also listed in M&R as 2M-390, 2M-391 and 2M-392. The given descriptive name is Souvenir of Hawaii, Statue of King Kamehameha. Collectors do get confused with the Souvenir of Honolulu version (HK-723 or 2M-393). How rare is the 49th State Error? http://www.socalleddollar.com/study2ndED.html John Raymond has complied a tabulation of sales from 1975 – 2000. Sales of HK-722, HK-722A, and HK-722B are zero. Image (click to enlarge) is taken from NGC US Coin Census to show that HK-722B is not listed and the extreme rarity of HK-722 and HK-722A. Image below is a HK-722B in my collection. It took some time to locate one. This HK-722B has undergone conservation as it suffered from bronze disease. It’s still a hard medal to locate. Hawaiian Money: Standard Catalog 2nd Edition, page 9, identifies provides a brief bio on Edward Bailey. My wife is the great-great-great-great granddaughter of Edward Bailey. Cannibalizing The 1991 Hawaiian Regency Set ? At a total out of pocket cost of $358.5 (eBay Buy it now $465 – 10% eBay Discount ($46.50) – eBay Bucks ($60.00) with free shipping), this was a bargain price for a 1991 Hawaiian Regency Set. The Hawaiian Regency set originally sold in 1991 for $495.00. This was the seller’s second listing for this very same set (originally listed for $495.00 on May 11th) with a losing reserve bid of $390.66. Set population is 900. The key coin within the set is the X# MB63, the so called Princess Kaiulani 1/10 ounce Platinum Hapaumi Puela with a catalog value of $200. Population is 900. 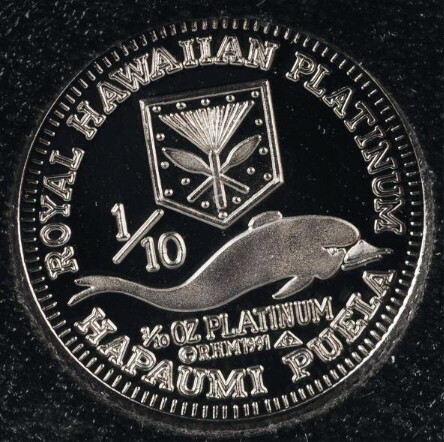 The platinum Hapaumi Puela was only sold in the 1991 Hawaiian Regency Set. The advance Royal Hawaiian Mint collector knows that there were only two instances where the Princess Kaiulani design was struck in platinum, not for sale pattern striking of 3 in 1994 (with Save the Dolphin reverse) and as part of the 1991 Hawaiian Regency Set. The set also contained a X# MB65, Queen Liliuokalani 1/10 ounce Gold Hapaumi Crown with a catalog value of $165. 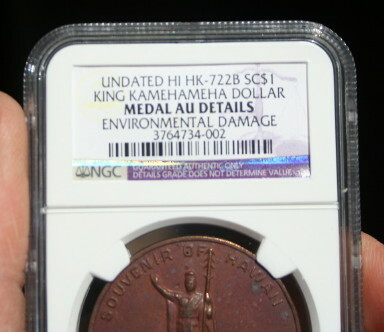 Population is 1,200 (900 from the Hawaiian Regency Set and 300 individually sold coins). Lastly, the set contained X# MB64, Akahi Dala, 1 ounce silver with a catalog value of $50.00. Population is 1,350 (900 from the Hawaiian Regency Set and 450 individually sold coins). Below is a public image of the reverse of the platinum 1/10 ounce Hapaumi Puela. 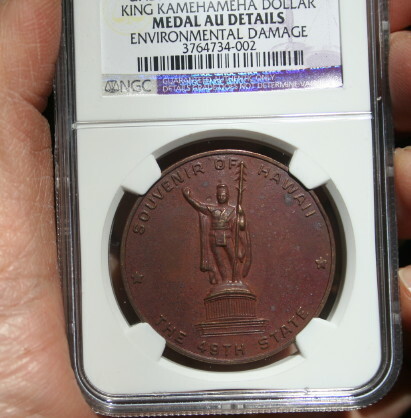 Actual images of the coin to be posted at a later date.